I cannot remember a time when I didn’t have a fear of public speaking. The shaky voice and knees, the butterflies, getting too much into your head just minutes before you begin your presentation. I don’t know why I feel like this about public speaking, but I’m not alone. You have probably heard about surveys often showing that people fear public speaking more than death itself. 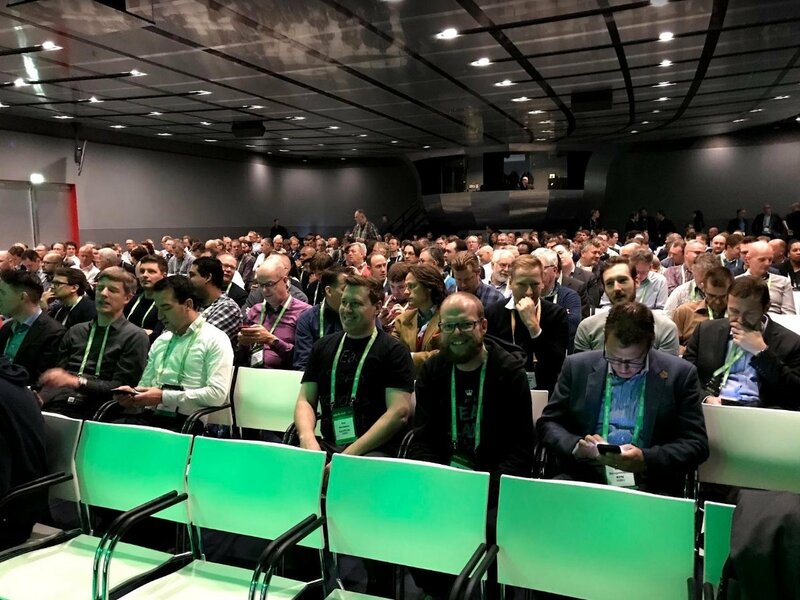 I still have my fear, and I stress a lot on the build-up to my talks, but looking back two years ago I would never have thought I would ever speak at a conference. In this post, I want to take you through what I think are the key things that have made a difference in me feeling more comfortable with public speaking over the last 18 months. At Coolblue, we work in two-week sprints. At the end of each sprint, teams will demo what they have been doing over course of the sprint, and what they have coming up. The demos are done in front of a small group of colleagues that you know and work with closely, so this was a low barrier to entry for me to get started speaking to a group. Tip: Use small events where you are only a little uncomfortable to begin with. It’s a good way to start pushing yourself, but to not feel feel huge amounts of pressure as they are people you speak to regularly. As I was getting more comfortable speaking in front of colleagues, I started ramping up the number of presentations I was doing internally. I also switched roles to one which has more of a focus on coaching, so it gave me a lot more opportunities to get up in front of people and present and teach. I created a set of “standard” presentations I would give to a team, and I ran through these over and over again with different teams, often sharing the same presentation several times a week. Repetition makes speaking in-front of people feel more normal and reduces the nerves about it. The content of the presentations also becomes very familiar with repetition, allowing you to relax more. Tip: Once you start feeling comfortable speaking in front of small groups, make sure you keep it up and do it as often as possible so it starts to feel a regular part of what you do. After a few years of work, you start to collect some stories about what you have achieved, or what you have failed at and learnt from. The major things I learn about and want to talk about go my blog posts which I can then easily convert later into presentations. It also reduces the stress when you have to create a talk and have already fleshed out most of what you want to say in blog form. Tip: Write down your stories, what you have learnt and work achievements (and failures). It gives you a lot of easy material to refer back to and convert into presentations later. People can learn valuable lessons from your experiences, even if you perceive them to be failures. 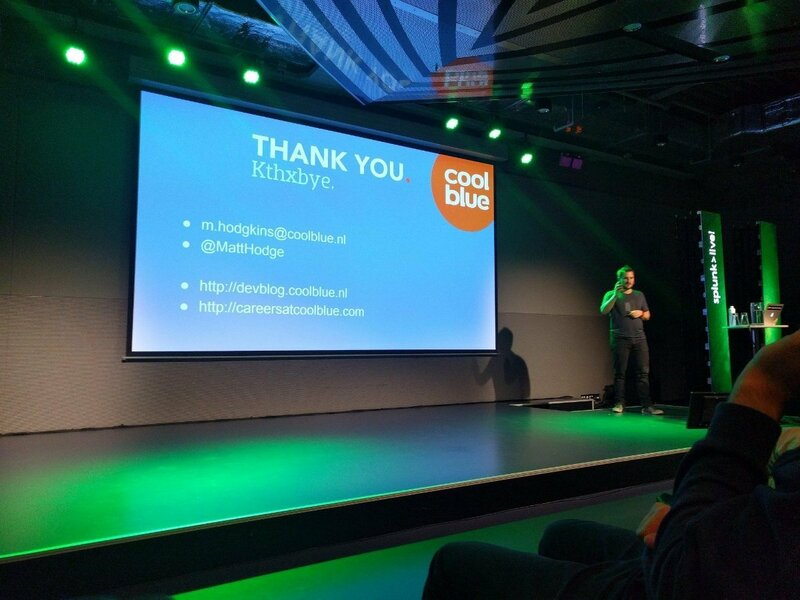 At Coolblue, there is an event called Behind the Scenes, where a few times a year, different teams from the Coolblue Tech Department give presentations to an external audience to give attendees a taste of what we are doing internally. 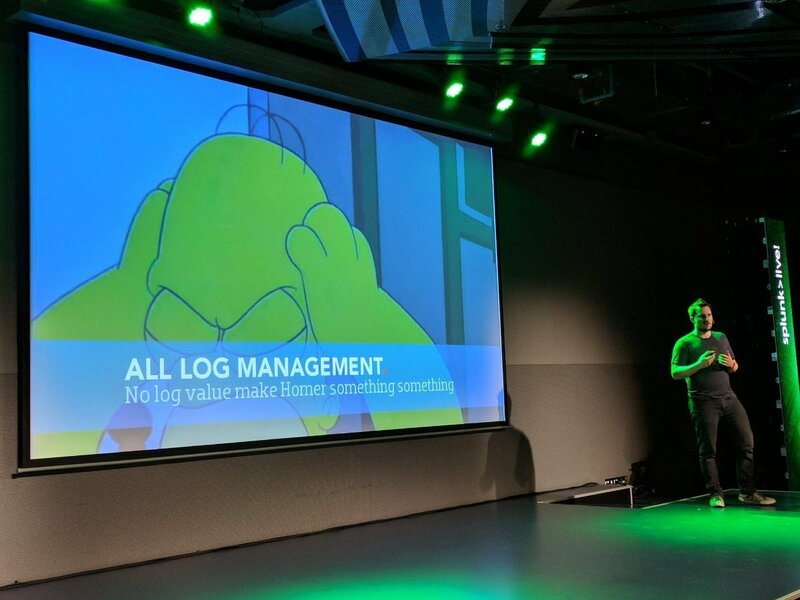 Our team was chosen to do the presentation for the event, which of course filled me with dread as I would have to speak in front of a lot of people. One of my team members Flynn Bundy, is a comfortable public speaker so we teamed up. We did a 45-minute joint presentation to 90 attendees - something I was not comfortable doing alone just yet. This provided me with a “safety net”. If for some reason I was too nervous or shaky to do something, Flynn could simply take over the session and the crowd would be none the wiser. Tip: If possible, rope in a confident friend or colleague to present with you. It makes the stress and build up to the presentation more manageable, and if you get too nervous it allows them to take over. I am fortunate to find myself surrounded by people who are more confident in presenting at conferences than I am. Flynn is just one of the many colleagues I am able to learn from. Pat Hermens and Paul De Raaij are fellow Coolbluers who have given several presentations. I also have the occasional beer or 7 with Jaap Brasser who travels around the world talking at various PowerShell events. I learnt a lot from these guys, not only in relation to presentation skills, but also how they prepare, what their thought process is, and how they deal with nerves before their talks. I probe them with questions, especially when I have an upcoming presentation. Not only did they give me help, but they also applied a little pressure. They knew I wanted to start doing conference talks and improve my presentation skills, so would bug me with links to call for papers for upcoming conferences, and keep asking me when I would speak at their user group. Eventually, you run out of excuses and just have to say yes. Tip: Surround yourself with people that are already doing what you want to achieve, ask them questions and listen to their advice. Look for mentors and do not be afraid to ask them if you can practice presenting to them. They may be able to help you polish your delivery. You are never going to stop being nervous about public speaking if you don’t do anything about. Just like everything else (except if you are lucky and gifted from birth), you are going to need to work at it. This includes all aspects of public speaking, preparation, how to tell a good story, how to deal with your nerves. All aspects need to be worked on so you can feel more and more comfortable getting on stage in front of people. Make a goal to do a certain number of presentations a year, and get your manager involved so they can push and support you. They will be able to help you seek opportunities to practice and build this skill. Watch TEDx and other conference talks and focus on how the presenter is presenting. For example, watch how the better presenters will have very little text on their slides, just enough to prompt their story. Watch YouTube videos on presentation skills. I found this one particularly helpful in relation to how to capture the audience in the opening: How to Do a Presentation - 5 Steps to a Killer Opener. Read other posts and articles on public speaking. /r/PublicSpeaking is a good source. I think practice is the most important thing you can do before a presentation. Knowing a presentation off by heart really makes a difference when the nerves kick in. Being able to sort of “switch your brain off” and just let the words flow out of you like some sort of presentation robot (without the monotone voice) is the level of practice you want to get to. I find I am most nervous at the very start of a talk, but trying to get in the zone and falling back onto my practice and repetitions really helps me get through. I would also recommend trying not to use speaking notes. You may need them at the very beginning of writing your presentation when you are in the creation phase, or for tricky phrases/sections of your presentation, but try limiting it to just that. The reason for this is it forces you to practice and know your topic. If you don’t have notes, and you didn’t practice, good luck presenting an awesome presentation once the nerves kick in. You want to get to a level with your practising that you have a slide with the dot points, and that triggers you to say what you need to say. During all your practices, you will start to notice certain parts of the presentation you get stuck on or constantly screw up. Make little notes during practice and either cut these out or refactor that part of what you want to say to make sure you are hitting your points accurately each time. Tip: Practice! Practice! Practice! Practice in the mirror, practice on colleges, practice on your family (even if they do not fully understand the subject). Just practice, practice, practice. With all the practice you will be doing to prepare for the event, it’s going to get pretty boring speaking to your own face in the mirror so many times. Your partner also doesn’t really care about how you migrated 100 applications from the ELK Stack to Splunk in a few weeks. Lean on your work colleges for your practices, and ask for feedback. This is one of the things that originally shocked me about moving to the Netherlands - just how honest, direct and blunt the feedback was I was getting. No one was sugar coating it for me, if they thought it was crap, they would say so. At first, I thought it was really weird, but I have really come to love this part of Dutch culture. Try and practice your presentation a few times on different groups of 2-3 people. Write down all of the feedback you received and go back and refactor your presentation. Practice it on a different group a few days later. This refinement process helps makes sure your presentation is well tested on many groups so you can be sure it makes sense and is a coherent story. It also gets you comfortable telling the story in front of an audience (even if it is a small one). All this practising and refactoring after the feedback takes time, so make sure you are prepared and do this a few weeks out before the talk. You want to lock in the contents of the talk completely about two weeks out so you can just practice the same content up until the big day. Tip: Go through your presentation on small groups of people well before the big day. Make sure you ask for honest and direct feedback, then use this feedback to refactor, refine and polish your story. Then you can feel comfortable knowing it has passed the scrutiny and suggestions of many of your peers. When the big day arrives, invite a colleague or friend with you. Perhaps bring one of your colleagues that you have bored to death with your multiple practices so they can see the big moment you have been working towards. A part of your brain might be telling you “no don’t bring anyone - if you screw up then someone that knows you will know you are a failure!”, but you will be glad you did. I find it helps to keep your mind distracted before the event so you do not work yourself up. It is also nice to have someone to vent your stress to before you have to go on stage. Make sure you have your supporter take some pictures of you up on stage. It’s nice to see what you looked like up on stage and have some pictures to be proud of and blast on Twitter once you have finished. It also gives you something to refer back to later before your next talk so you can tell yourself “See, I’ve done this before, I can do this again!”. Tip: Bring a long a supporter and make sure they take some pictures for you. I am pretty proud of what I have achieved tackling my fear of public speaking over the last 18 months. I am definitely not over it yet, and still get stressed before big presentations (just ask my wife!). With more and more practice, and making sure I stick to my goal of presenting at two conferences a year, I hope public speaking will eventually just become a “normal” thing that I do and no longer be a big deal that I stress over. Hopefully these tips can give you the boost you need to go tackle your fear and get presenting. 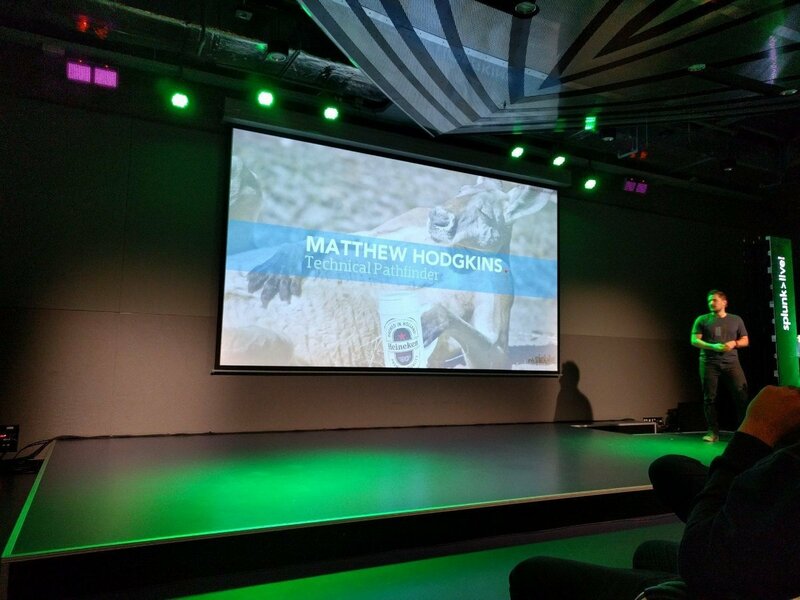 Hit me up on Twitter @MattHodge if you want to share your experiences or chat about public speaking.